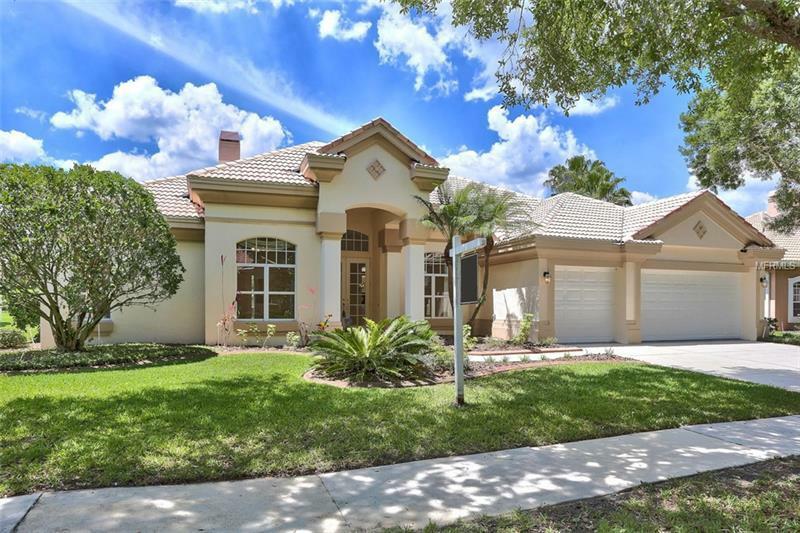 Custom-built home located in Osprey Pointe of Hunterâs Green. Fabulous floor plan w/ 3633 sqft of living space. Plenty of room to spread out while enjoying the easy Florida lifestyle in this Executive style home. Includes formal Living Room w/ fireplace formal Dining Room large Great Room with built ins 4 Bedrooms Office Large Bonus Room could be 5th Bedroom w/ two closets window seat & sliders that lead to the gorgeous Pool and Spa 3 full Baths one Â½ Bath & 3 car garage. Located on breathtaking home site with view of pond. Fully equipped kitchen has built in oven and microwave smooth top cooktop 42" cabinets breakfast bar & separate breakfast room w/ mitered glass & is adjoined by the spacious family room with built ins & large sliders that lead out to the resort style swimming pool spa and outdoor kitchen. Spacious master bedroom with view to the pool and pond. Large master closets master bath has double sinks & garden tub w/ separate shower. Other features include: beautiful and stately double French door entry 12-foot ceilings fireplace tile in great room foyer walkways kitchen baths laundry room with utility tub. The community of Hunters Green offers a private Country Club with Golf Course. Hunters Green is conveniently located close to Advent Hospital Wiregrass mall Tampa Premium Outlets Highways (I75 I275 I4) Walking and Biking Trails Parks Shopping Restaurants Beaches & the Airport. Donât miss the opportunity to own this gorgeous home! No CDD.